"Misha is the interpreter for Shizune and a fellow member of the student council. Cheery, playful, and never one to pull a punch, she happily joins in Shizune's attempts to get Hisao onto the student council." Shiina Mikado (御門椎名, Mikado Shīna), commonly referred to as Misha (ミーシャ, Mīsha) is the friend of Shizune Hakamichi, as well as her de facto interpreter. Unlike the other students, Misha has no mention of a disability that prompted her to be enrolled at the school, but there is some speculation (based on her personality) that she has ADHD, OCD or perhaps some form of autism. However, this is very unlikely as it was established that Yamaku Academy does not cater towards students with mental disabilities. A developer stated on the official IRC that she had only "A broken nail in 3rd Grade"
As regular students can enroll at Yamaku, and because Misha has expressed a desire to become a sign language teacher, it is possible that she attends simply to become more proficient at signing to master her skills. Misha has a "bubbly" personality, to the point of being overbearing. She often speaks in a high volume much to the dismay of Hisao and Mutou. She has been described as "girlish" and playful, in juxtaposition to Shizune. Rather than refer to people by their names, she will use nicknames, such as Hicchan (Hisao) and Shicchan (Shizune). She is occasionally oblivious to what is happening around her, such as Lilly and Shizune's heated arguments. In these cases, Shizune's comments, often loaded with malicious intent, generally lose their meaning by the time Misha interprets them in her trademark style. In Shizune's route, it is revealed Misha is in love with Shizune, but was rejected and still holds these feelings. Before the game's full release there was much speculation among the fanbase as to Misha's disability. Many assumed she had a fatal condition (most likely cancer) and would die during Shizune's route. In the full release, Misha either has no disability (Yamaku Academy accepts healthy students) or it is not revealed. Many speculate that she has ADHD or a similar condition, due to her personality. Another conjecture is that she has an inner ear problem that affects hearing and balance. She has never learned to ride a bike, has trouble on the stairs, and has trouble kissing Hisao, and is apparently oblivious to how loud she is. Coupled with being proficient in sign language, this could mean she knows she will lose hearing as she gets older and is prepared for that. However it's worth noting that her issues with stairs was only mentioned once as an excuse and at no point in the story was she ever shown to actually have issues. 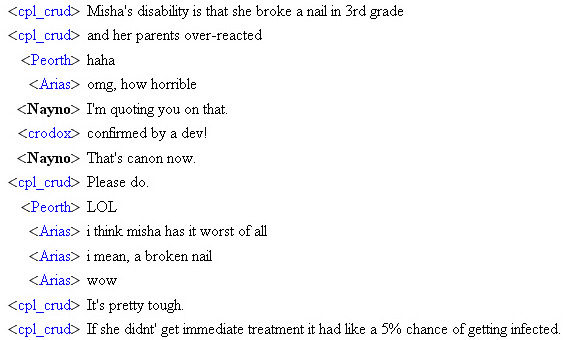 One of the devs stated that Misha's disability was a broken nail. It is unknown whether or not this is canon. Nickname is derived from her real name when written in standard Japanese format (Mikado Shiina). Only character outside the five main girls who has an H-scene. In the beta version, she commits suicide, after being heartbroken over Shizune and Hisao's relationship. In the good ending, Shizune and Hisao deal with the trauma and consider naming a child after her. In the beta version on Hanako's true route she is hinted at meeting Emi in the art room whilst looking for Rin. This lead them to do "secret" things and closer to the end of Hanako's true route go back off to "finish"